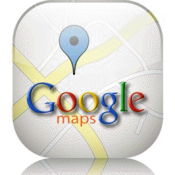 Google maps is one of the best mapping apps available for the BlackBerry devices. BlackBerry’s come with a maps program but I dont think it matches the power or speed of Google maps and fair play to Google they’ve kept the app very much up to date with periodic new releases. You can have street views (if available in that location), Satellite views, or plain old map views of any location around the golbe. You can ask for directions and search for places of interest. There’s also traffic information for major roads (even in Ireland). You can view terrain and if you like keeping people abreast of your location then you can use the “Latitude” function to show friends where you are. Favourite places can also be stored. All in all this reall is a must have app and if you do get it remember to delete the BlackBerry native app as you’ll never need it again.